Inferno has a small album on Flickr. Artoo is a terrible mechanical design. 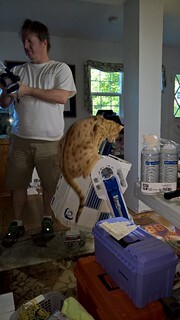 You can see that in some of Lucasfilm's R2-D2 Extras where they talk about building him and stuff. For starters, the front foot appears to merely be there as something for him to trip over. In the replica droid business this leads what is known as a "faceplant." Yes, L3-G0 has faceplanted (fortunately without the dome). 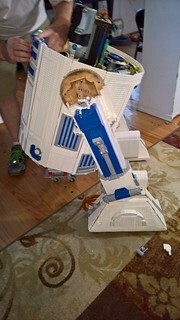 Lego R2-D2 doing the "Faceplant"
Basically, there's not enough distance in the front foot from the center of gravity to provide good leverage when you run into an obstacle. In this case a sidewalk crack as I was trying to get in out of a light drizzle. In order for the front wheel to turn, it's on casters, and those can't be very big because they'll hit the foot shell. So the small diameter also makes it hard to cross cracks like the one at the bottom of the picture. (I thought all of the cracks would be as small as the earlier cracks). 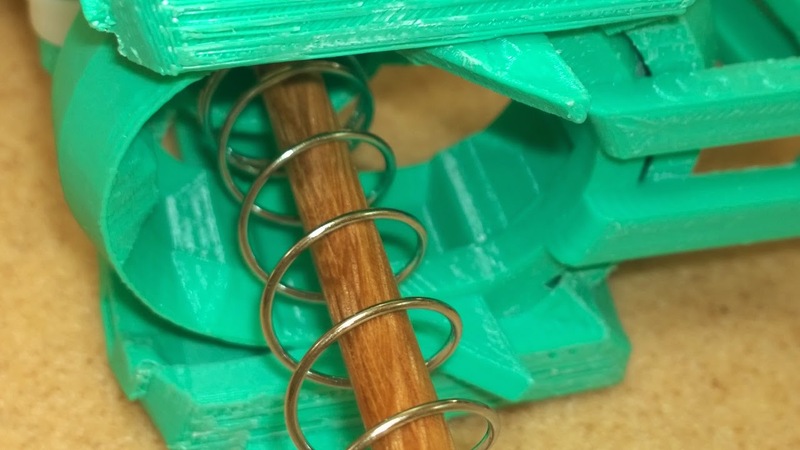 L3-G0 is "worse" in this regard because the Lego bricks make his front foot shell pretty thick on the bottom, reducing the available wheel diameter to about 2" (about 5cm). Another problem is that his front foot is hinged at the ankle (thinking about 2-3-2 mode), which means that if the front wheel drops in, then it stays. Any kind of bump is potentially disastrous. So I really look out for those. If the caster drops in or has to climb over, it leads to tripping. If its "small enough" I try ramming it gently and seeing if he'll make it. If not, then I either back over the obstacle or lift the front over it. If the terrain is too soft, then his wheels dig in. This happens on padded carpet. He either can't climb out or the foot shells can even ride on whatever it is. Another problem is "rough" terrain. 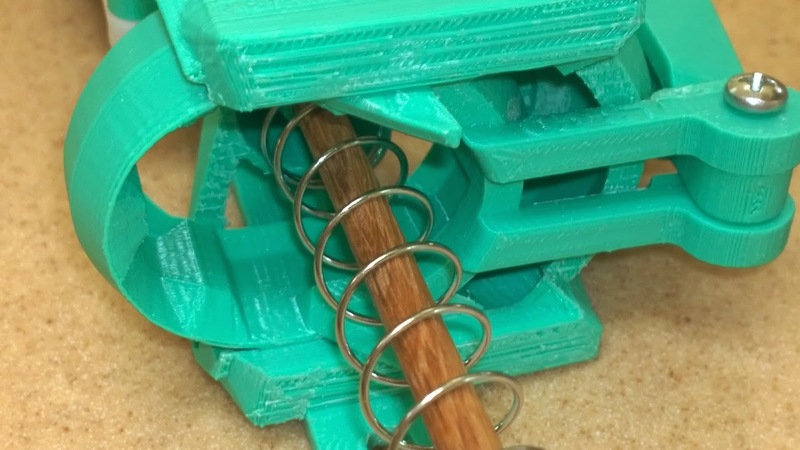 The drive train can handle a sidewalk or pavement, but most exterior surfaces are pebbly and cause a lot of vibration, which wants to shake him (literally) to pieces. There's also a limit to the incline L3-G0 can safely traverse. Especially ramps going down he wants to coast and we have to use power to brake him. So is there anything L3-G0 CAN drive on? 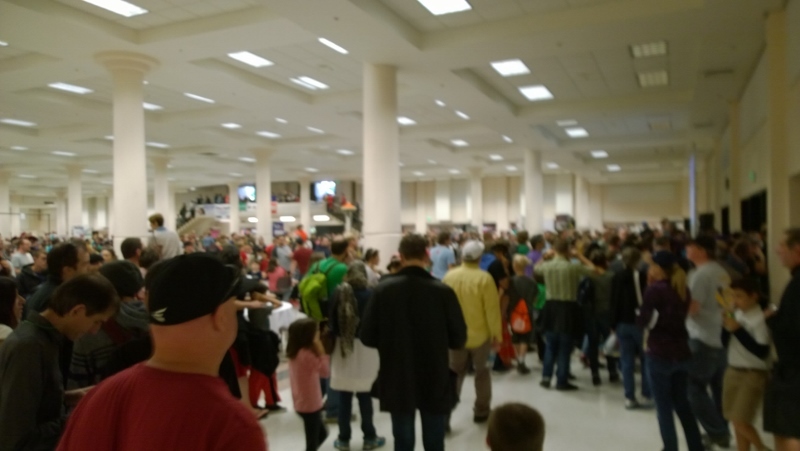 Fortunately most convention halls and public spaces have big flat smooth concrete floors. I just have to watch for the expansion gaps between slabs and cable runs. Most houses have similarly smooth slabs in their garages, but watch for the crack! Driveways or streets are often too rough or steep. (For Halloween we put out mats for him on our driveway). 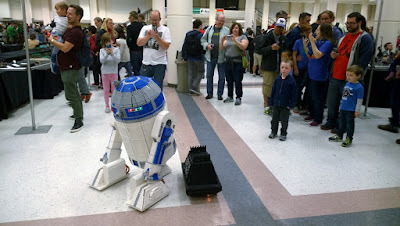 He can usually climb the 1/4" onto the carpet some folks put down for their booths (like when he visited the Lego booth at Celebration). The wood floor in our house is fine, though we have a 1/4" rise between rooms I have to watch. Tile is another scary area because it has lots of little cracks, and can be rough on top depending on the style. Close fitted tile or linoleum tiles are fine. Industrial carpeted areas are usually OK, though they can drain the battery a bit more than concrete. However the carpet in the lobby at Rose City (Oregon Convention Center) seems padded more than normal. A typical house carpet is too soft to really be passable. Wheelchair ramps are often a good path for him, not being too steep. Tracks (like a tank) could help some, but you still have steering issues. 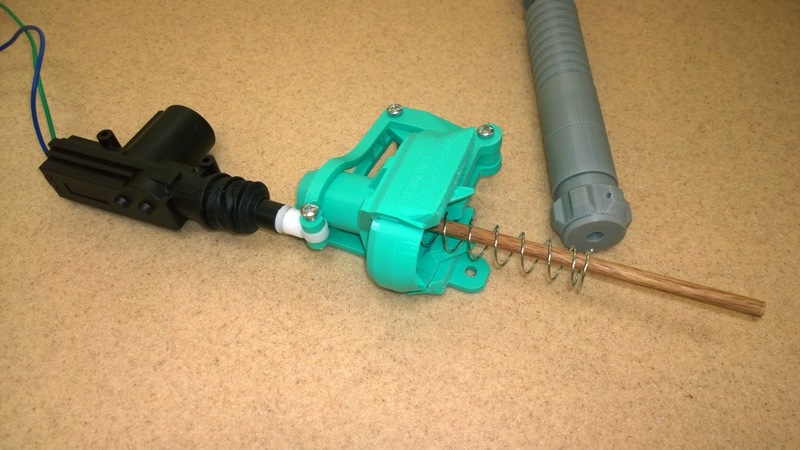 Some builders have created a system that can navigate a grass yard (though that would shake L3-G0 apart). 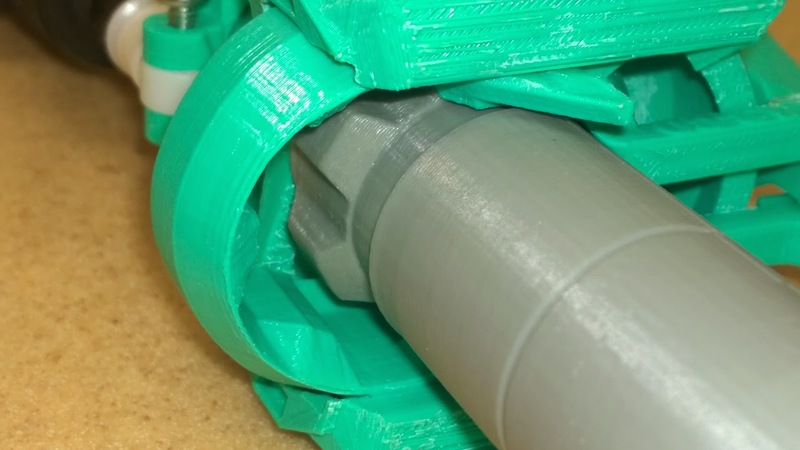 Some of the fanciest systems have a single large diameter rotating wheel up front, sometimes even powered, but that typically requires complicated mechanical systems. L3-G0 could also have a more rigid front ankle, however that can lead to other issues. I've limited it's play a little, but he was designed to have it be flexible so stiffening it is tough. Oliver and Lee came up with a system using a hub motor for Star Wars VII: The Force Awakens, which seems to help a lot. Some of the other builders are trying that. (I confess that it's on L3-G0's to-do list). In the meantime I watch out for rough surfaces. Subtitle: how to be completely out-of-sync since I haven't even posted about (much) earlier events.... Oh well. 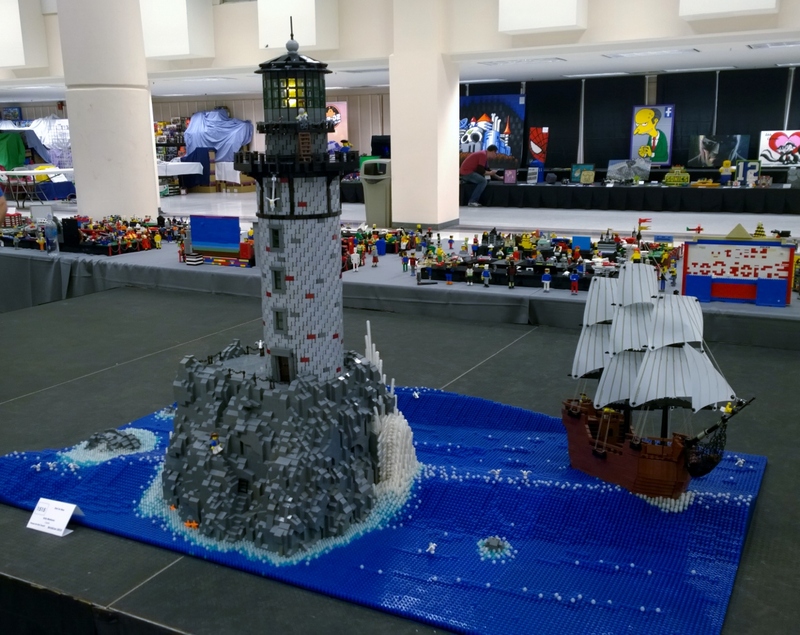 This weekend was Brickcon 2015, one of the biggest Lego conventions around. 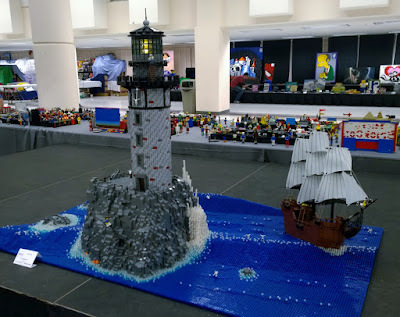 Tons of "well known" Lego artists show stuff there, and we've been going most recent years. We represented the R2-D2 Builder's Club, showing off the banner we picked up at Star Wars Celebration Anaheim. On Saturday we had some excitement when the fire alarm went off. Apparently some mom had her kiddo in one of those backpack things, and was leaning against the wall to rest. When she went to leave, the kid was apparently really curious about this thing attached to the wall and tried to hang on. 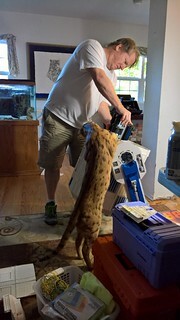 Lara was wrangling L3-G0 at the time and was wondering what kind of whacky noise she'd triggered! MCK-Y also took it upon himself to go entertain some of the folks in the crowd outside waiting to get tickets (there's often a line, particularly in the morning). Unfortunately, he also tried to test the strength of this wall by backing into it! Lego Mouse Droid driving through fountain! Here are some of the other MOCs (My Own Creation, 'cept that these other people's creations, it's a Lego Builder acronym for things they make). These computers were also our neighbors, Look at those Lego cases! 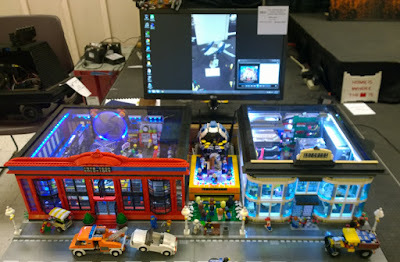 On Sunday we were privileged to receive the BrickCon 2015 People's Choice Award. What a cool honor! We're glad you liked L3-G0 and MCK-Y, and thanks to everyone who voted for us. 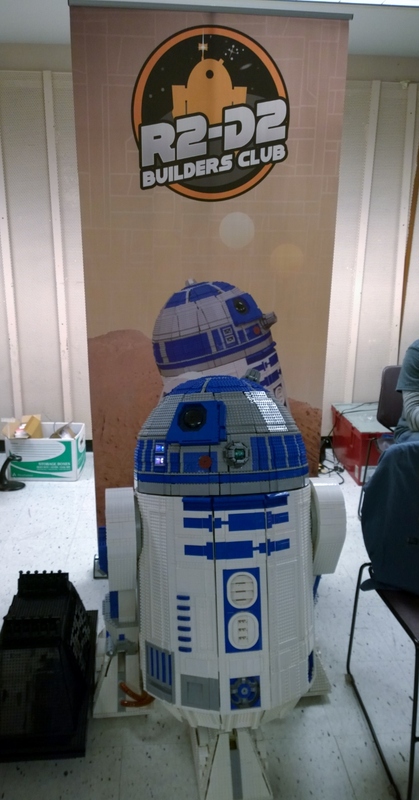 We go to the cons because like showing off the droids for the crowds, especially when folks are excited and curious, but we don't mind winning prizes :) There were tons of other great and deserving Lego Creations at the show, so we're thrilled and humbled that you chose us. L3-G0 trying the People's Choice Trophy on as a hat! Taking something like L3-G0 out and exhibiting him causes a lot of wear and tear. Foot motors break, shoulders get smashed, fuses blow, etc. One common problem I've had is with the holoprojectors. 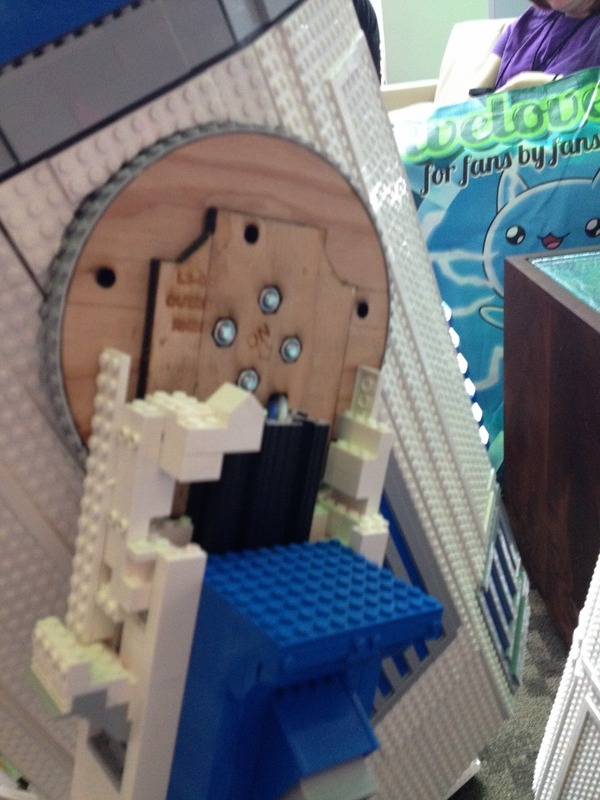 There are 8 panels on each one (alternating fat/narrow), attached by Lego clips. The clips break, as on the bottom left. This HP lost a panel before the show even started, but I lost 3 more during the show. I moved one down to be less conspicuous earlier, but right after the show closed some toddler yanked the HP off his back and when it came back it had even fewer panels. 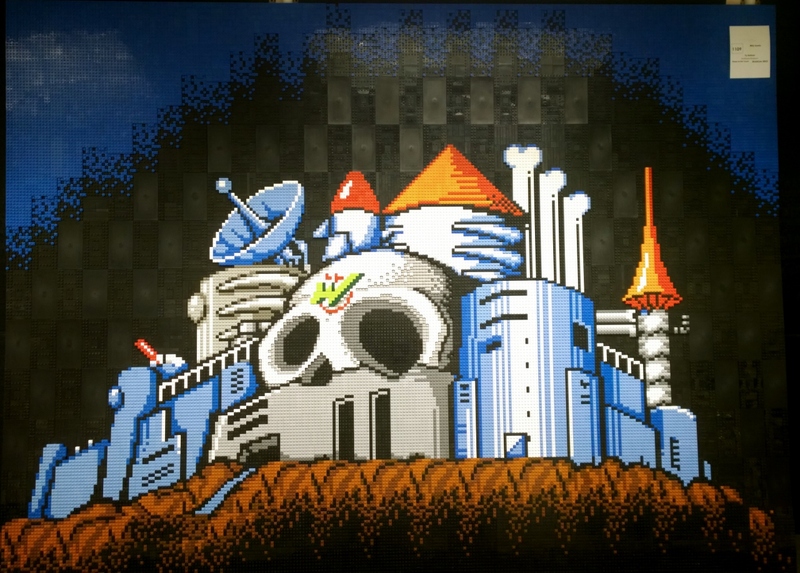 Anyway, this is one place I have to Kragle. The narrow arms especially want to fall off, and the 1x1 rounds. The clips are free to move though, and the axle fits in a round hole that lets the entire HP move and be positioned. Biggest problem was that one of the chargers failed. We made do, but fortunately Shorai replaced it under warranty. At RCCC the slip ring that powers the dome lights also got disconnected at the plug, and shorted, blowing a fuse. So that needs repaired too. 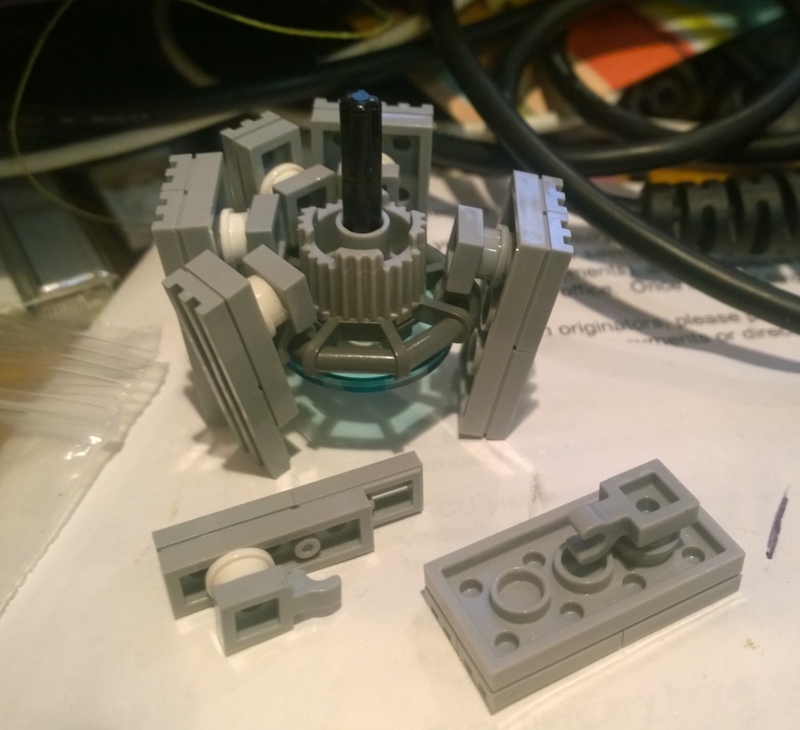 Also a few misc parts form the feet. Left battery box isn't staying on very well. Lastly one of the feet might be slipping. The RCCC convention center has nasty carpet. Can Lego Bricks be Jinxed? L3-G0 went to a small school's kid's dance last night. Everyone had a great time, and he danced with some of the kids. Most of the kids at the school knew L3-G0 already, but they were happy that he could join in. Given the environment, there was a lot of touching and stuff, and eventually there was a small accident with his LEFT shoulder, which had to be repaired. And made me wonder if bricks can be cursed? Is it possible to have unlucky bricks? Cursed? Jinxed? Did I run afoul of a Voodoo Doctor somewhere? 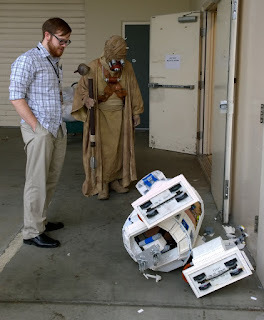 On the completed L3-G0's first outing, to Emerald City Comicon (ECCC), there was a bit of a mishap. He was driving along and the escalator reached it's rail out to smash him in the right shoulder. (I'm sure that's what happened, I would have never driven that close to the rail!) Since the escalator was moving, bricks when flying everywhere. Huge gasp from the crowd. Very impressive. We even got censured by security and prohibited from the escalator for some reason. (Ironically this is one of my favorite pictures of him. I just love the Tuskan Raider's expression - it was he who invited me, and this is before the event I was supposed to participate in). Next time the curse struck was at Rose City Comicon (RCCC, kinda like ECCC, but smaller). Things were going well, but one of the vendors shoved his table out into his shoulder as I turned the corner (I'm sure that's what happened, I mean he looked nice and all, and the table was loaded with stuff so it looked like it couldn't possibly move, but there's no way I was inept enough to drive down a 50 foot path and smash into a table on one side). You guessed it, the right shoulder was destroyed AGAIN!!!! No pix, sorry. Of course we're getting better at fixing the shoulder by now. Mishap #4 was back at that accursed book store. This time it was an endcap full of books that attacked. Darth Vader was there and may have used the Dark Side to yank L3-G0 into the books. This time we were picking right shoulder bricks out from between the books. We had uneventful trips to Children's and some schools and work and stuff, but then it was time for Star Wars Celebration, Anaheim. 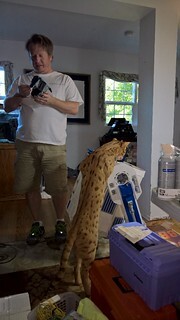 Which I know I still need to blog about, but until then he has some pix on facebook. On the way down we stopped in Endor (Redwoods park) to take a cool photograph. Unfortunately Lara stumbled. I'm sure she was falling away from R2, but at the last instant she jumped towards him and smashed down on the... wait for it... right shoulder! (You could've guessed by now. The fifth time we smashed his right shoulder). Fortunately a couple kind schoolteachers helped get the bricks out of the dirt and a while later we were ready for the pictures. After several stops (including LEGOLAND) we reached Celebration! And there was a lot of activity, running around, launching lightsabers and generally showing off, which all went pretty smoothly. 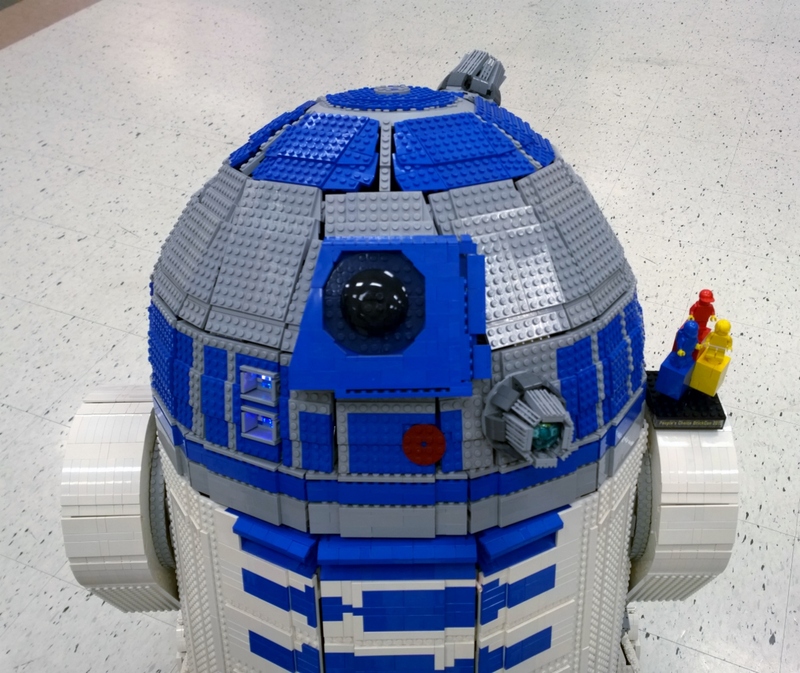 R2 Builders have had huge debates and discussions about "Buttons Front" or "Buttons Back". You see, at the top of his legs, each of Artoo's shoulder has 2 buttons on one side and a hydraulic bar on the other side. Unfortunately the legs are kind of interchangeable, so in some scenes and movies, they're flipped, sometimes buttons are front, sometimes buttons are back. 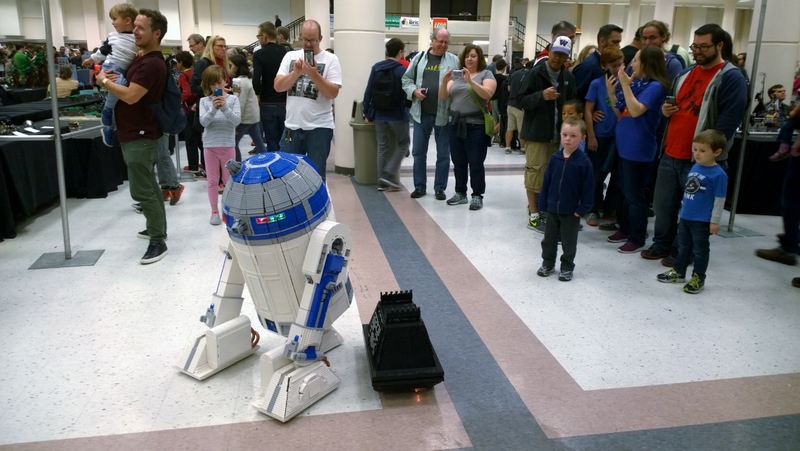 At Celebration we met Lee and Oliver, a couple great fellow builders who built R2-D2 for Star Wars Episode VII: The Force Awakens! (Way to go guys, he looks great!) 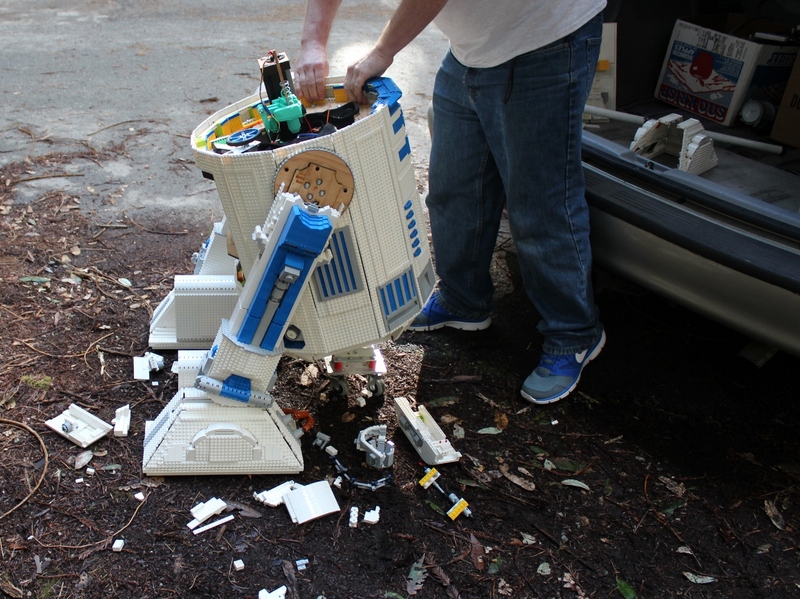 Anyway, building Artoo for the movie they had to make a decision, and the decided "Buttons Front." That's all well and good, however L3-G0 was built "Buttons Back". I don't remember all of my reasoning, but thought about flipping the shoulders. 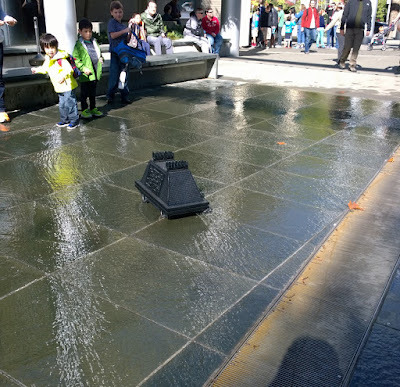 On day three, we were hanging out by the Sandcrawler, and someone teased us that Oliver had said "Buttons Front". I was like "fine", and ripped the shoulders off and flipped them, putting the left shoulder on the right side and the left on the right. I think I surprised him, most builders are pretty picky about the buttons decision. They're symmetrical so it was pretty easy and I'd been thinking about it anyway. I thought it looked a little funny at first, but now I don't notice. What do Buttons have to do with this story? 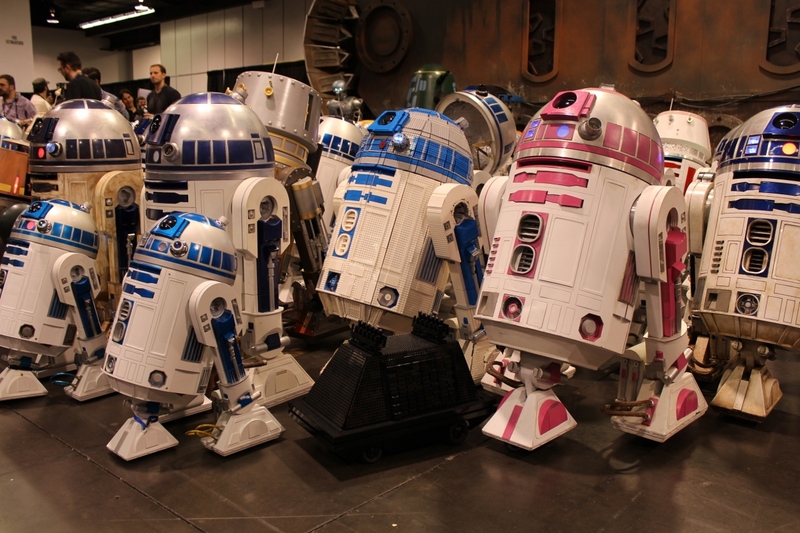 ﻿﻿Of course there was lots of maneuvering and people getting their droids into place. 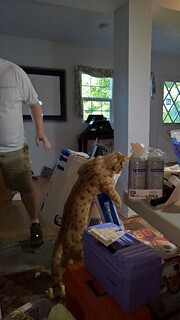 During all of that activity someone was a little unbalanced and reached for... wait for it.... Can you guess? L3-G0's LEFT shoulder. Small pile of bricks on the floor, fortunately not too bad of a fix. Got that? His right shoulder was smashed 5 times, then we flipped the bricks around and the next time it was the left shoulder, SAME BRICKS! They must be cursed. Which brings us back to the dance. 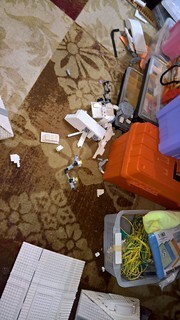 No picture, but there was a small oops and L3-G0's left shoulder fell apart onto the dance floor. Now it's twice since moving the bricks to the other side. So Can Lego Bricks be Jinxed? L3-G0 is made out of Lego, and all sorts of things happen, his feet have to be snapped back together quite often as that what sticks out the most. His head gets dizzy and bricks wiggle loose. The dog's stepped on his head. We've fried electronics, etc, etc. But smashed shoulders is one of the most annoying problems and he's had his shoulders destroyed a total of 7 times now. It's been different shoulders now, but the same bricks all seven times! The totally random odds of having two shoulders and smashing the same shoulder bricks 7 times in a row is 1 in 128. Kind of between the odds of rolling double sixes on 2 dice and triple sixes on 3 dice. I use to think I was just leading with the right shoulder somehow, but now??? I thought it was bad when it was 4 in a row. I think he's got some cursed bricks. Maybe they were bought from a seller that runs a Voodoo shop on the side or something. Somehow his bricks have been jinxed. Maybe it's just the main ones that connect to the rest of the leg. Maybe it's the whole thing. At least I know which side is L3-G0's unlucky one! The Death Star had plans, what about Lego Artoos? Every occasionally I get asked to share plans for L3-G0. I encourage everyone to build things they love with Lego, but sharing the plans is hard. REALLY hard. L3-G0 had a rough design, however the "plans" don't come close to the as-built model, so there's a lot of work/confusion that would happen if someone started to build another. It'd probably take me a month of hard work to have something decent enough to share. Nothing personal, but I don't have a ton of free time. In addition to the Lego model, there are many internal bits of other materials that add to the complexity of the build. He has an aluminum and wood frame with laser cut wood bits. Nothing individually that crazy, but this isn't your normal Lego build. You could get away without some of that if you wanted a static version, but he wasn't designed to "stand" without some of that structure. 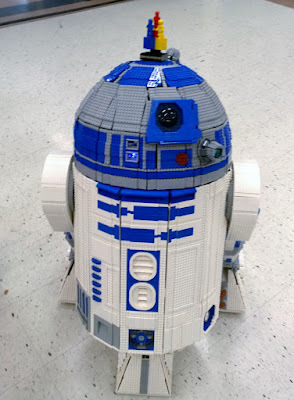 For the dynamic version he also has 3D printed bricks internally and of course wires and motors and electronics. None of that's a huge deal, but does make things a bit more complicated. Probably the biggest problem is 16,000 Lego Bricks. Think about that. 16 thousand bricks. Big Lego sets are 1-2 thousand bricks. And those are a completely different very specific group of bricks. So how do you get 16K bricks? There are places that people part out sets like bricklink and ebay. But lets go back to that number: 16K bricks. Bricklink has 251 million bricks listed right now. But almost all of those are the completely wrong bricks. When I bought bricks for L3-G0, I ended up buying several kinds for which I bought all of the only bricks of that shape/color available. Now lets consider what happens if I post the plans. Obviously 10 kids are going to ask dad (or mom) to help build him. If word got out, then it's 100 or 1000 or more. Lego sells 7 sets a second. A quarter billion a year. Presumably 0.001% of those would consider building a Lego R2 instead (or in addition). That tiny number would be 2,000 builds started a year. Let's pretend I'm way off and it's only 20. Lets look at Bricklink again. Take those 16K bricks times 20 people. That's 320K very specific bricks. That is a HUGE number. Buying the bricks for one L3-G0 distorted the market price of some bricks for a year. I just looked at one of the common bricks. There are enough for make 2 or 3 Artoos on sale right now. Most of those however are in small lots, which is going to make shipping fees prohibitive. Supply and demand would do the rest. 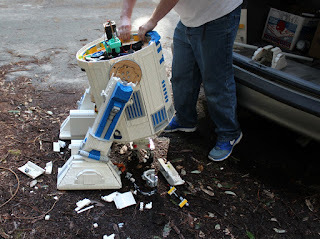 10 people trying to make Artoo would cause the price of those bricks to skyrocket. Instead of asking $3,000 for the bricks, you'd be looking at more like $10,000 or $25,000. So most of the people that started wouldn't have a chance of finishing. 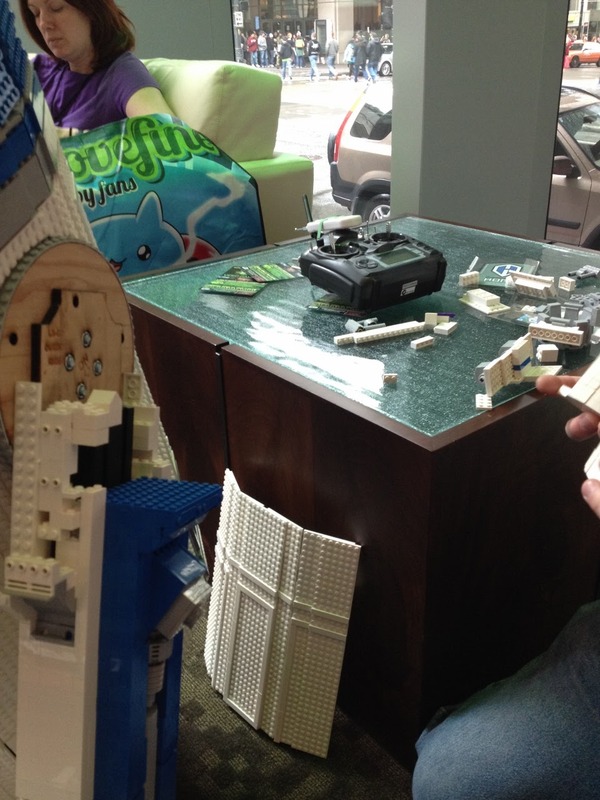 Worse, look at the Lego clubs and exhibitions around the world. Where do they get their bricks? What if someone wants to build a really cool white castle? Then we've totally messed up their ability to get bricks as well. All that sounds pessimistic, and, to be frank, it sounds like I'm making excuses for not wanting to share the plans. Mostly though I don't have the time to create usable plans, and I don't want to set up a bunch of kids for failure. At this point our best bet is Lego Ideas. 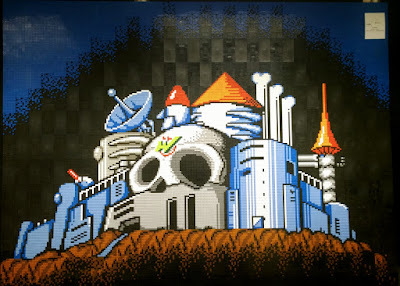 You may want to follow me there... https://ideas.lego.com/projects/63519 is another project I tried.